The will to see and to represent beyond the immediate surrounding visible and object world is the urge that conducts Patricia Dauder’s work. She captures and visualizes what is extremely difficult to retain: time, a fleetig moment, an ephemeral trajectory an idea, something with no form, a remote place. 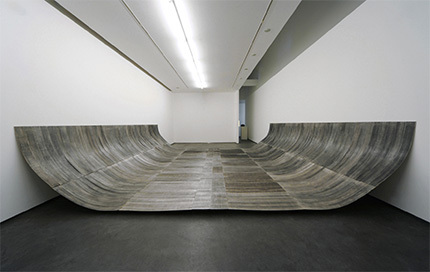 Her work is essentially visual, a common feature to all the media she uses, whether they are three-dimensional objects, drawings, photos, films, or collected images. Their interpretation does not come through a narrative o textual source but solely through observation, which gives way to multiple associatiors and subtle meanings. Biomorphic traces, elliptically shaped images, gridded linear construcutions, references to natural elements mix with allusions to cinematography, experienced as a tool for the observation and for the sequencing of space and time. 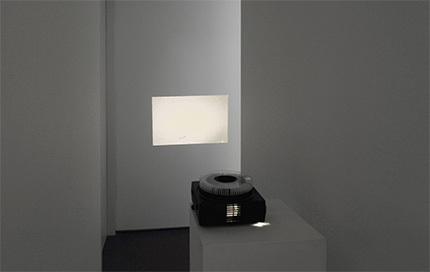 For Studio03, Patricia Dauder (Barcelona, 1973), has presented three works: Balsa, a big wooden sculpture dominating the space of the gallery, Forward (slides), a slide projection of 80 black and white 35mm slides, and Cast, a drawing. Balsa is a 5,22 x 5,11 metre circular wood structure. 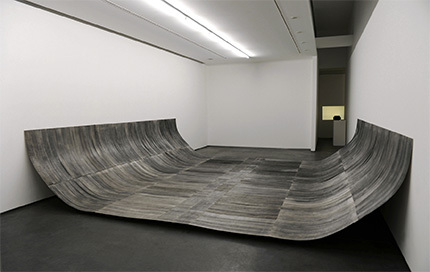 The sculpture is made out of 400 units of balsa wood planks coloured black with charcoal. All the parts assembled conform an oval structure spreading out from wall to wall, slightly reminiscent of a ship´s hull, lacking though the strength of a real ship construction, as the material employed, balsa wood, is very fragile. The conception of this piece comes from the artist’s interest for traditional wood construction methods used in shipbuilding and with an early obsession, to build a large circle within a real square space. The first attempts of a similar structure where pursued during a six-month residency of the artist in New York City, where she could appreciate, specially in certain urban peripheral areas, like Rockaway Beach, the common use of wood in the ubiquitous old vernacular architecture and in the numerous wrecked vessels abandoned at the bay area. In the artist’s words “I was fascinated by those remains in which I could see the past in the present, New York´s history and its tied relation to the sea”. The experience, iconography and literature around sea culture and big expeditions is a recurrent reference in her work, not so much distinguishable with recognisable motifs, but somehow more imbued with the concept of fernweh or wanderlust, “an ache for the distance”, the impulse to wander or travel faraway. The sculpture was made following a slow and methodical construction process similar to that of her drawings, in which each pencil line/wood plank conforms a small but distinctive part within a complex image, as it happens in Cast, a drawing, graphite on paper, measuring 94 x 34 cm. Forward (slides) shows a series of windsurfing maneuvres called Forwards and Backloops which consist on jumping forwards and backwards in the air at high speed under heavy wind and waves conditions. The photos capture the precise moment when man, sail and board turn in the air without showing any other element in the scene, and the time interval between each slide permits the viewer to recreate a certain illusionistic but uncomplete motion because of the frequent sequences intercuts.